A Mass of Christian Burial will be held at 10AM on Tuesday, September 4 at St. Dominic’s Church for Robert “Bob” Hosa, who passed away Wednesday, August 29. Bob was born on November 18, 1927 in Youngstown, Ohio. He was the son of Joseph and Mary (Jones) Hosa. He graduated from South High School. On February 9, 1952, he married his best friend and love of his life, Mary Scheetz, and together they shared 64 years. Bob was a veteran of the Army. After 34 years, he retired in 1982 from the marketing department of Ohio Bell Telephone Co. Afterwards, he served as vice president of Ohio Office Interiors. 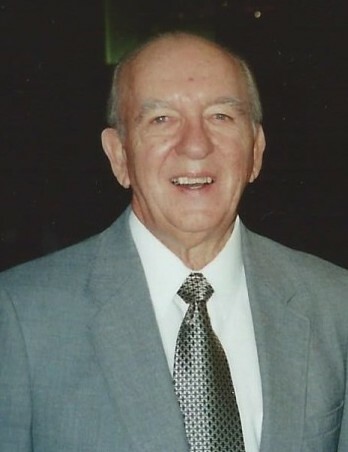 Bob was an active member of St. Dominic’s Church, where he served on the Parish Council, was a member of the Holy Name Society, taught CCD and was a lector at Mass. He also served as president of the North Side Kiwanis Club. Bob was truly an avid sports fan. He loved his golf and belonged to several leagues. In 2006, he achieved his goal of a HOLE-IN-ONE. Additionally, he played baseball and belonged to several bowling leagues. He was a true Cleveland sports fan and loved watching the Indians, Browns and Cavs. To cherish Bob’s memory, he leaves behind his son, Michael, of Boardman, who was his amazing caregiver, his daughter, Carol (Dan) Cibock, of South Carolina, Granddaughter, Janelle (Paul) Bartholomy, of North Carolina and grandson, Benjamin, of Virginia. Other than his parents, he was preceded in death by his wife, Mary, his daughter, Janet, his brothers, Tom, John and Joseph and his sisters, Josephine and Helen. Bob’s family would like to extend a special thank you to Ohio Living Hospice and Bob’s caregivers from First Light whose attention and care was greatly appreciated in Bob’s time of need. Friends and family may call from 9 to 10AM on Tuesday morning at St. Dominic’s Church. The burial will take place at Calvary Cemetery. Bob’s family requests that contributions be made to Ohio Living Hospice, 6715 Tippecanoe Rd, Building E. Suite 201, Canfield, Ohio 44406 or St. Dominic Church in Bob’s honor.